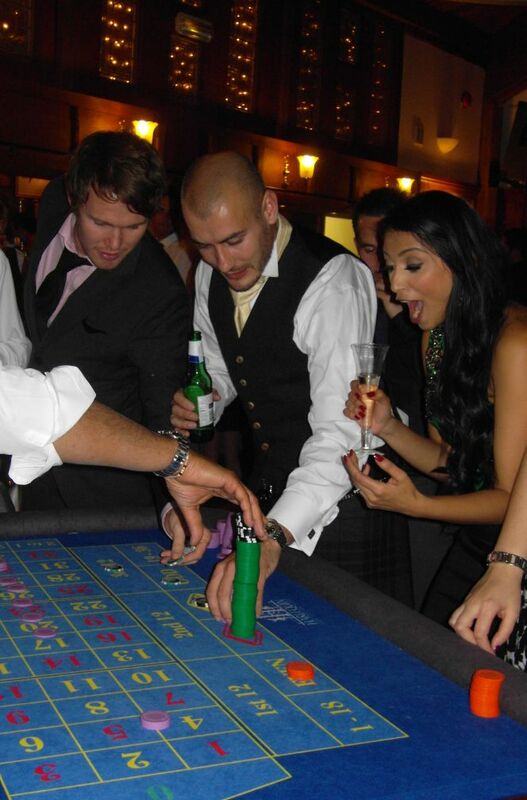 Fun casino tables make a fabulous addition to any party, and if you’re planning a vegas themed party, a James Bond party or a prohibition theme night, then our luxury casino tables will give your party that extra kick of authenticity. There’s nothing quite like a fun casino to get the party started, whether it’s a birthday party fun casino, an anniversary party fun casino or a wedding reception the atmosphere is always the same… Electric! When you’re organising a party, there are lots of things to sort out. You find a venue, sort out the decorations, maybe hire a dj or hire a band for the night, and make sure there’s plenty to eat and drink. But if you want to treat your guests to a night they’ll remember for all the right reasons, hire some fun casino tables for them to play on all night long. How much of a feature you make the fun casino is entirely up to you. Often, we’re asked to set up our tables in a side room, so that people who do not want to dance at the party have something else to do. Other times, we have set the fun casino tables up in the centre of the room, and played Vegas music all night long to get everyone into the party casino spirit. The choice is yours. You could theme your party and add props and decorations. The James Bond theme is very popular, as is the Hollywood party theme, the Chicago Prohibition theme and of course the Las Vegas theme – The possibilities are endless. Our casino tables are made in the same way and to the same specifications as the tables you’ll find in any professional casino. We spent time ensuring every last detail was made to look as authentic as possible so that when they’re installed into any venue, the guests and players will feel like they’ve been transported to the buzzing Las Vegas casino floor. We purchase all our accessories such as our playing cards, casino chips and blackjack shoes from a gamablers store in downtown Las Vegas, so the casino experience you get with Harlequin is just about as authentic as you can possibly get. Every attention to detail has been paid to give you and your guests a great casino experience, and to ensure you’re using the best quality chips cards and accessories. Take a look at our guide on how to hire a fun casino to find out more.